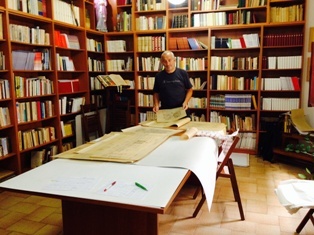 He offers his skill and talent as an engineer cataloguing the many documents and plans, with a particular interest in those of the famous Italian architect Bernabiti, who amongst many constructions, built several of the Catholic Churches and institutions in Rhodes and the surrounding islands. Thanks to his work and that of the resident voluntary archivist Dr. Lucia Conte, many of the plans have now be filed, stored and conserved in a professional manner. We wish to thank all those who give their times so generously with enthusiasm for the benefit of our community.